The NER Class M1 (later Class M) locomotives were Wilson Worsdell's first express passenger locomotives for the North Eastern Railway (NER). In 1892, Wilson Worsdell initially proposed a locomotive similar to his brother's D22 (NER Class F) locomotives with a smaller boiler, Stephenson valve gear, and simple expansion. This proposal was not accepted, but the NER's Locomotive Committee instructed that one compound and twenty simple expansion express locomotives should be built. The major difference from the original proposal, was the use of a boiler slightly larger than that used on the D22 instead of one which was smaller. The compound locomotive was initially classed as Class M, but was reclassified as Class 3CC in 1914. The LNER gave it the separate classification of Class D19, and here it is discussed on its own page. The twenty Class M1 locomotives were built at Gateshead between 1892 and 1894. Compared to the D22, the boiler was 11in longer and had 1in greater diameter. A 6ft 9in long firebox was fitted, and a 160psi operating pressure specified. The boilers were actually built to sustain a higher pressure, and they were soon increased to 175psi. In contrast to his brother's preference for Joy valve gear, Wilson Worsdell chose to use Stephenson valve gear. The inside-frame cylinders used outside-frame flat valves. The motion was inside the frames, and rocking shafts operated the valves. The last locomotive (No. 1639) was built with piston valves instead. Strangely, No. 1639 retained the outside-frame valve position but this was later corrected. The class M1 locomotives were followed by an order for ten more engines in October 1895. These were slightly different in that the cylinders were 19.5in diameter with a 26in stroke, and the flat valves were fitted between the frames. The cab roof was also given a clerestory section. The differences were sufficient for the the NER to give them the new classification of Class Q. Two 7ft 7.25in diameter wheel variants were built as Class Q1 (LNER D18) at the same time. The Class Q engines also had a modified boiler with a deeper firebox and a small reduction in tubes. The overall result was a reduction in weight, and there is some evidence to suggest that this was driving force for many of the modifications. The initial batch of ten Class Q engines were built in 1896, and they were followed by two further batches of ten each in 1897. All were built at Gateshead. In late 1898, there was a proposal to build twenty more Class Q engines but using the Class M1 boiler. The proposal was modified to include a larger boiler, longer firebox, and a 200psi operating pressure; resulting in the Class R (LNER D20) locomotives. No further Class M or Class Q engines would be built. All of the Class M and Class Q engines were intended for use on East Coast express passenger services. Hence they were fitted with a Westinghouse brake for both the engine and the train, and a vacuum ejector for alternative train braking. The Westinghouse pump was positioned within the splasher, between the coupled wheels. The new cylinders and piston valves were also fitted to the Class Q engines from October 1913, and was completed in 1930. Unlike the Class M engines, most of the Class Q engines received superheaters at the same time as the piston valves. However there were a few exceptions, and the last Class Q was superheated in 1931. 18-element Schmidt superheaters were used for both the Class M and Class Q boilers. Although the NER classed the Class M and Class Q as different locomotives classes, in reality they were very similar locomotives after they had been rebuilt with piston valves. 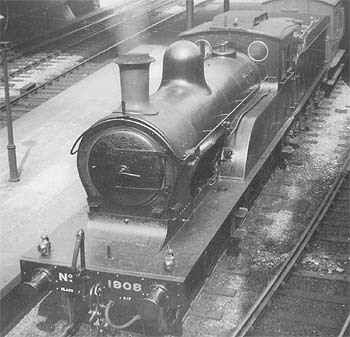 Initially the LNER planned to use the D16 classification for the Class M locomotives, but with the Great Eastern Railway (GER's) ongoing construction of the first 'Super Claud', it was decided to give the 'Super Clauds' the classification of D16 and to combine the NER Class M and Q locomotives into Class D17. Class M became sub-class D17/1, and Class Q became sub-class D17/2. The most significant visual difference between the two sub-classes was the shape of the main frames. The D17/1 engines had a downward reverse curve in the top profile behind the smokebox. The D17/2 engines had frames which were slightly lower behind the smokebox, and there was a single downward sweep. All of the D17 boilers were built with Ramsbottom safety valves, with the exception of the last batch of fourteen replacement boilers (built in 1927-9) which were fitted with Ross pop safety valves. Hence most of the D17s did not receive LNER-standard Ross pop valves, and the last D17 to be withdrawn (No. 2111) still had Ramsbottom valves fitted. Both the Class M1 and Class Q engines were built to haul express passenger services on the East Coast main line, and were initially put to work hauling the York to Edinburgh stretch of the newly introduced 2:30pm dining trains. This required four engines to operate the service in both directions, due to the need to switch locomotives at Newcastle. Allocations were to St. Margaret's, Newcastle, and York. These locomotives were heavily used during the 1895 "Race to Aberdeen". During the final week of the races, the train was reduced from 120 tons to 105 tons and the M1 engines were used without double-heading. On the final night, York to Newcastle was covered in 78.5 minutes at an average speed of 61.6mph. Newcastle to Edinburgh was reached in 113 minutes at an average of 66mph. It is generally assumed that the driver (R. Nicholson) only managed this time by ignoring speed restrictions on curves at Morpeth, Alnmouth, and Portobello; and a 5mph limit through Berwick station! The Class Q engines generally displaced the Class M1 engines from the very best of the top jobs, but both could be found working alongside each other on the main line. Three years later, the new D20s displaced both the Class Q and Class M1 engines from many of their main line duties. Between 1910 and 1918, the even larger C6 and C7 Atlantics were introduced, further displacing all of the NER's 4-4-0s (including the Class Qs and Ms) to lesser duties. 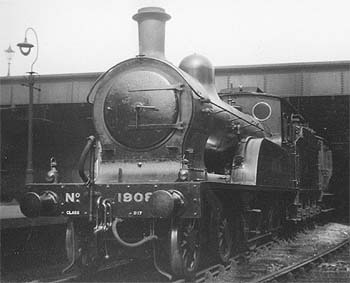 By 1920, only half of the Class Q and M engines remained at main line sheds. Gateshead and Botanic Gardens (Hull) both had significant allocations for semi-fast and stopping services. By Grouping (1923), the D17/1s were allocated to Botanic Gardens (10), Gateshead (5), Tweedmouth (4), and Alnmouth (1). The D17/s 2 were allocated to Carlisle (8), Scarborough (6), Neville Hill (5), Gateshead (3), Starbeck (1), and West Hartlepool (1). 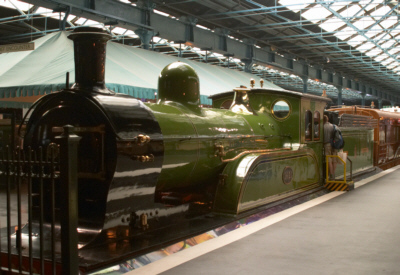 The Hull engines were used on ordinary passenger services to Doncaster, York, Leeds, and Scarborough; as well as occasional excursion duties. The Gateshead engines usually worked services to Berwick or Carlisle. These kinds of secondary passenger duties were typical for the D17s at this time. During the 1920s, there were few changes in the D17 allocation. The most significant significant was the loan of three D17s to the former Great Eastern (GE) area in 1927. Allocated to Cambridge or Stratford, these three engines were used on lighter duties - eg. the midday stopping service from Ely to Liverpool Street. During the 1930s, Nos. 1871 and 1873 were allocated to Hull, and were often used as a replacement for Armstrong Whitworth diesel-electric railcar Lady Hamilton during its many repairs. The first D17 to be withdrawn was No. 1628 after a collision with D22 No. 96 at Hull Paragon station on 14th February 1927. Normal withdrawals started in 1931. Two D17/1s and seven D17/2s survived to the outbreak of World War 2. The two D17/1s were withdrawn in 1945, with No. 1629 being scrapped but No. 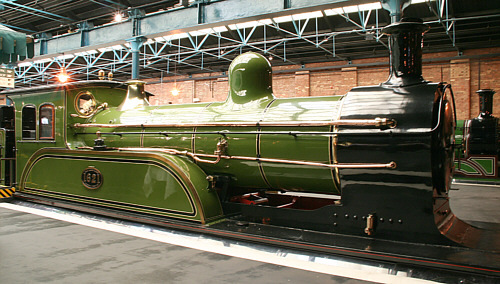 1621 was restored and placed in the York Railway Museum. Five of the D17/s were scrapped during 1943-5. The last two D17/2s just survived into British Railways ownership and were withdrawn in 7th February 1948. Final duties included pilot work, local stopping services, and hauling the inspection saloon. The following details are for the D17 locomotives in their final form, with piston valves and superheated boilers. The quoted weights are for the D17/1 locomotives. The D17/2 weighed 50t 6cwt, and had a maximum axle loading of 18t 16cwt. One D17/1 has survived into preservation, and is now a part of the National Collection. The 3mm Society produce a kit of the D17/1 for 3mm scale. London Road Models (ex-Steve Barnfield) sell a 4mm scale (OO gauge) kit of the D17. Fourtrack produce kits of both the D17/1 and D17/2 for 7mm scale (O gauge). Ben Cripps is currently the custodian of a live steam Gauge 1 model of D17/1 No. 1629 built by Tom Barratt (see picture). Thank you to Rob Marsden and Peter Langsdale for the photographs of the preserved D17 at the National Railway Museum. Peter's photograph is the larger photograph, taken from the locomotive's right. Thank you Malcolm Peirson for the photographs of No. 1621. Thank you to the Rosewarne family for the photographs of LNER No. 1908. 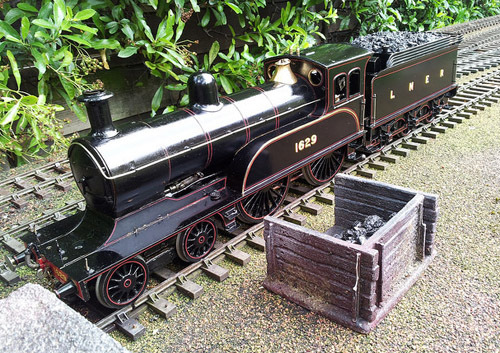 Thank you to Rob Langham for the photograph of NER Class Q (LNER D17/2) No. 1927 at Gateshead.